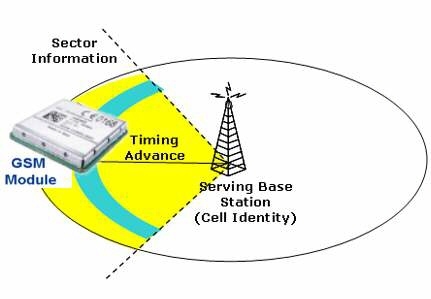 There is several theories for GSM locating. Here we concentrate on locating by Timing Advance (TA) combined with Angle of Arrival and analysing sector antennas. The TA value is usually between 0 and 63, each step representing an advance of one bit period (approximately 3.69 microseconds). With radio waves travelling at about 300 meters per microsecond, one TA step then represents a change in round-trip distance (twice the propagation range) of about 1100 meters. 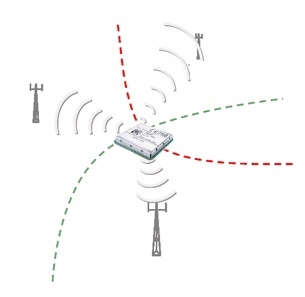 This means that the TA value changes each 550 meter, change in the range between a GSM module and the base station. This limit of 63 × 550 meters is the maximum 35 km distance that a device can be from a base station and is the upper bound on cell placement distance. If you are able to catch the Timing Advance twice or even more often, then you are able to calculate the position even more accurate. One option could be to use the AT command for GSM band selection. If you are in Europe then you select GSM 900 / 1900 and after that you select GSM 850 /1800. GSM 850 and GSM 1900 does not exist in Europe. This will force a registration to a GSM 900 MHz cell and a GSM 1800 MHz cell. Another option could be to use two different SIM cards or even better a foreign SIM card. If you are on roaming, then you can get the TA from different GSM operators.